I believe this notion to be propped up by a series of misconceptions that stand in dire need of correction. 1. NATO is not a war-legalizing body, quite the opposite. NATO, like the United Nations, is an international institution that has something or other to do with war, but transferring the UN’s claimed authority to legalize a war to NATO has no support whatsoever in reality. The crime of attacking another nation maintains an absolutely unaltered legal status whether or not NATO is involved. Yet NATO is used within the U.S. and by other NATO members as cover to wage wars under the pretense that they are somehow more legal or acceptable. This misconception is not the only way in which NATO works against the rule of law. Placing a primarily-U.S. war under the banner of NATO also helps to prevent Congressional oversight of that war. Placing nuclear weapons in “non-nuclear” nations, in violation of the Nonproliferation Treaty, is also excused with the claim that the nations are NATO members (so what?). And NATO, of course, assigns nations the responsibility to go to war if other nations go to war — a responsibility that requires them to be prepared for war, with all the damagesuch preparation does. 2. NATO is not a defensive institution. According to the New York Times, NATO has “deterred Soviet and Russian aggression for 70 years.” This is an article of faith, based on the unsubstantiated belief that Soviet and Russian aggression toward NATO members has existed for 70 years and that NATO has deterred it rather than provoked it. In violation of a promise made, NATO has expanded eastward, right up to the border of Russia, and installed missiles there. Russia has not done the reverse. The Soviet Union has, of course, ended. NATO has waged aggressive wars far from the North Atlantic, bombing Bosnia and Herzegovina, Kosovo, Serbia, Afghanistan, Pakistan, and Libya. NATO has added a partnership with Colombia, abandoning all pretense of its purpose being in the North Atlantic. No NATO member has been attacked or credibly threatened with attack, apart from small-scale non-state blowback from NATO’s wars of aggression. 3. Trump is not trying to destroy NATO. Donald Trump, as a candidate and as U.S. President, has wondered aloud and even promised all kinds of things and, in many cases, the exact opposite as well. When it comes to actions, Trump has not taken any actions to limit or end or withdraw from NATO. He has demanded that NATO members buy more weapons, which is of course a horrible idea. Even in the realm of rhetoric, when European officials have discussed creating a European military, independent of the United States, Trump has replied by demanding that they instead support NATO. 4. If Trump were trying to destroy NATO, that would tell us nothing about NATO. Trump has claimed to want to destroy lots of things, good and bad. Should I support NAFTA or corporate media or the Cold War or the F35 or anything at all, simply because some negative comment about it escapes Trump’s mouth? Should I cheer for every abuse ever committed by the CIA or the FBI because they investigate Trump? Should I long for hostility between nuclear-armed governments because Democrats claim Trump is a Russian agent? When Trump defies Russia to expand NATO, or to withdraw from a disarmament treaty or from an agreement with Iran, or to ship weapons to Ukraine, or to try to block Russian energy deals in Europe, or to oppose Russian initiatives on banning cyber-war or weapons in space, should I cheer for such consistent defiance of Trump’s Russian master, and do so simply because Russia is, so implausibly, his so-inept master? Or should I form my own opinion of things, including of NATO? 5. Trump is not working for, and was not elected by, Russia. According to the New York Times, “Russia’s meddling in American elections and its efforts to prevent former satellite states from joining the alliance have aimed to weaken what it views as an enemy next door, the American officials said.” But are anonymous “American officials” really needed to acquire Russia’s openly expressed opinion that NATO is a threatening military alliance that has moved weapons and troops to states on Russia’s border? And has anyone produced the slightest documentation of the Russian government’s aims in an activity it has never admitted to, namely “meddling in American elections,” — an activity the United States has of course openly admitted to in regard to Russian elections? We have yet to see any evidence that Russia stole or otherwise acquired any of the Democratic Party emails that documented that party’s rigging of its primary elections in favor of Clinton over Sanders, or even any claim that the tiny amount of weird Facebook ads purchased by Russians could possibly have influenced the outcome of anything. Supposedly Trump is even serving Russia by demanding that Turkey not attack Kurds. But is using non-military means to discourage Turkish war-making necessarily the worst thing? Would it be if your favorite party or politician did it? If Trump encouraged a Turkish war, would that also be a bad thing because Trump did it, or would it be a bad thing for substantive reasons? 6. If Trump were elected by and working for Russia, that would tell us nothing about NATO. Imagine if Boris Yeltsin were indebted to the United States and ended the Soviet Union. Would that tell us whether ending the Soviet Union was a good thing, or whether the Soviet Union was obsolete for serious reasons? If Trump were a Russian pawn and began reversing all of his policies on Russia to match that status, including restoring his support for the INF Treaty and engaging in major disarmament negotiations, and we ended up with a world of dramatically reduced military spending and nuclear armaments, with the possibility of all dying in a nuclear apocalypse significantly lowered, would that too simply be a bad thing because Trump? 7. Russia is not a military threat to the world. That Russia would cheer NATO’s demise tells us nothing about whether we should cheer too. Numerous individuals and entities who indisputably helped to put Trump in the White House would dramatically oppose and others support NATO’s demise. We can’t go by their opinions either, since they don’t all agree. We really are obliged to think for ourselves. Russia is a heavily armed militarized nation that commits the crime of war not infrequently. Russia is a top weapons supplier to the world. All of that should be denounced for what it is, not because of who Russia is or who Trump is. But Russia spends a tiny fraction of what the United States does on militarism. Russia has been reducing its military spending each year, while the United States has been increasing its military spending. U.S. annual increases have sometimes exceeded Russia’s entire military budget. The United States has bombed nine nations in the past year, Russia one. The United States has troops in 175 nations, Russia in 3. Gallup and Pew find populations around the world viewing the United States, not Russia, as the top threat to peace in the world. 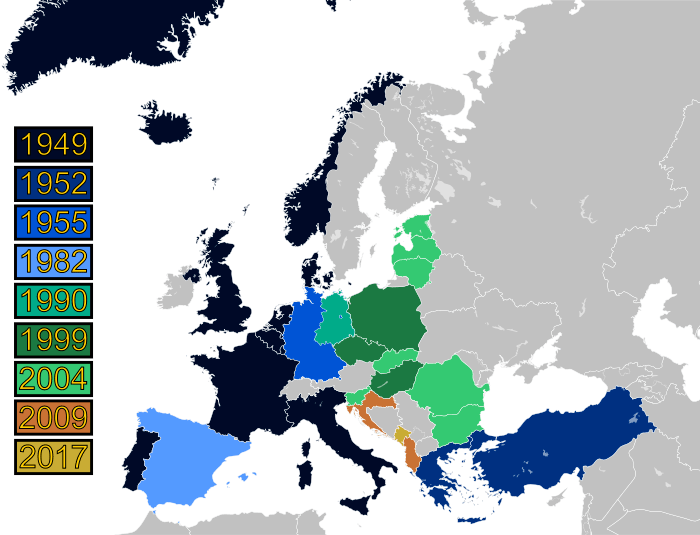 Russia has asked to join NATO and the EU and been rejected, NATO members placing more value on Russia as an enemy. Anonymous U.S. military officials describe the current cold war as driven by weapons profits. Those profits are massive, and NATO now accounts for about three-quarters of military spending and weapons dealing on the globe. 8. Crimea has not been seized. According to the New York Times, “American national security officials believe that Russia has largely focused on undermining solidarity between the United States and Europe after it annexed Crimea in 2014. Its goal was to upend NATO, which Moscow views as a threat.” Again we have an anonymous claim as to a goal of a government in committing an action that never occurred. We can be fairly certain such things are simply made up. The vote by the people of Crimea to re-join Russia is commonly called the Seizure of Crimea. This infamous seizure is hard to grasp. It involved a grand total of zero casualties. The vote itself has never been re-done. In fact, to my knowledge, not a single believer in the Seizure of Crimea has ever advocated for re-doing the vote. Coincidentally, polling has repeatedly found the people of Crimea to be happy with their vote. I’ve not seen any written or oral statement from Russia threatening war or violence in Crimea. If the threat was implicit, there remains the problem of being unable to find Crimeans who say they felt threatened. (Although I have seen reports of discrimination against Tartars during the past 4 years.) If the vote was influenced by the implicit threat, there remains the problem that polls consistently get the same result. Of course, a U.S.-backed coup had just occurred in Kiev, meaning that Crimea — just like a Honduran immigrant — was voting to secede from a coup government, by no means an action consistently frowned upon by the United States. 9. NATO is not an engaged alternative to isolationism. The notion that supporting NATO is a way to cooperate with the world ignores superior non-deadly ways to cooperate with the world. A nonviolent, cooperative, treaty-joining, law-enforcing alternative to the imperialism-or-isolationism trap is no more difficult to think of or to act on than treating drug addiction or crime or poverty as reason to help people rather than to punish them. The opposite of bombing people is not ignoring them. The opposite of bombing people is embracing them. By the standards of the U.S. communications corporations Switzerland must be the most isolationist land because it doesn’t join in bombing anyone. The fact that it supports the rule of law and global cooperation, and hosts gatherings of nations seeking to work together is simply not relevant. 10. April 4 belongs to Martin Luther King, Jr., not militarism. War is a leading contributor to the growing global refugee and climate crises, the basis for the militarization of the police, a top cause of the erosion of civil liberties, and a catalyst for racism and bigotry. 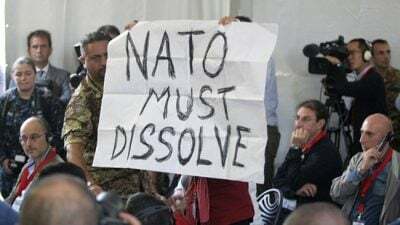 A growing coalition is calling for the abolition of NATO, the promotion of peace, the redirection of resources to human and environmental needs, and the demilitarization of our cultures. Instead of celebrating NATO’s 70thanniversary, we’re celebrating peace on April 4, in commemoration of Martin Luther King Jr.’s speech against war on April 4, 1967, as well as his assassination on April 4, 1968.